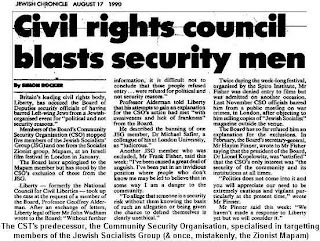 The CST's primary function is to protect the Jewish community from anti-Zionists, especially Jewish anti-Zionists. It is used primarily to steward Zionist meetings and events and its goons have on more than one occasion attacked and assaulted anti-Zionists who have dared open their mouths. See for example CST Thugs Violently Eject 2 Jewish People from Zionist ‘Environmental' Meeting, Community Security Thugs Bar Jewish Opponents of Gaza War from Liberal Judaism Meeting and The Community Security Trust - Policeman of the Jewish Community. The CST targets the Left and works closely with the Metropolitan Police, which says all you need to know about its anti-racist credentials. The corrupt and institutionally racist Metropolitan Police actively promote the CST within the Jewish community over and above other organisations (see articles by Geoffrey Alderman below). This is nothing new for the Police, whose 'community' strategy has always meant promoting favoured groups within what it sees as minority ethnic communities, at the expense of those groups it can't control. It was therefore no surprise that the CST, along with other Zionist groups, via its spokesman Mark Gardener, attacked the University & College Union (UCU) for rejecting the European Union Monitoring Committee’s Working Definition on anti-Semitism. In fact this definition, drawn up originally by the European Jewish Congress and the American Jewish Committe, has been abandoned by the EUMC’s successor, the Fundamental Rights Agency and was itself the subject of arm twisting and naked blackmail. The Working Definition is not only a useless definition in terms of collating statistics of anti-Semitic incidents, because it is subjective and therefore depends on individual interpretation, but because it conflates criticism of Israel and Zionism with attacks on Jews and anti-Semitism. The CST is particularly dishonest about this because, as Tony Lerman shows below, the CST itself doesn't itself adopt the MacPherson definition of racism when it comes to classifying anti-Semitic incidents, for the simple reason that MacPherson's definition came out of Police racism and was applicable solely to that organisation. If anti-Semitism was simply in the eye of the beholder then any fool or charlatan could claim to be the victim and any statistics collected would be meaningless. It is essential therefore, if statistics of anti-Semitic incidents are to have any value, that there be an objective basis to such a classification. When I sent the posts in question to the CST I made it clear that I considered both of them to be anti-Semitic. The CST disagreed. In their view Jews can never be anti-Semitic, even when they wish the Holocaust had been visited on other Jews. This is of course a political definition of anti-Semitism and one favourable to the Zionist movement, since Zionists are often the most anti-Semitic of all individuals. The CST itself instead of using the EUMC uses the definition in the Race Relations Act 1976 and Equality Law 2010, to define racial harassment both on the basis of individual perception (i.e. a subjective defintion) and on what is reasonable to treat as a racist incident i.e. an objective definition. What is even more hypocritical is that in the long years between the murder of Stephen Lawence and the MacPherson Inquiry, the Board of Deputies and CST weren't in the slightest bit interested in the Stephen Lawrence campaign. How much money or support did the CST or the Board of Deputies give to the Campaign? What publicity did they provide etc? None is the answer. You will find no mention of the Stephen Lawrence campaign in the Jewish Chronicle or the outpourings of the Board and CST. How many Zionists who now try to misuse the MacPherson definition of a racist incident, actually went to listen to the inquiry at Elephant & Castle to see young Black people full of hope that the Met would get its come-uppance? Again none. Like the parasites they are, the CST feeds upon a definition of racism against Black people, it wasn't in the slightest bit interested in. Anti-semitism is in any case not an example of state racism and is therefore even less suited to the MacPherson definition. The Chair of the CST's Trustees is Gerald Ronson, who was imprisoned in the Guiness Trial Affair some years ago. He is a right-wing private capitalist, who owns the Heron Group, which was (and maybe still is) the largest private company in Britain. He is part of a mafia of right-wing Jewish businessmen in Britain who promote a far-right and overtly expansionist Zionism within the Jewish community (others such include Stanley Kalms of Dixons and Richard Desmond of the EDL supporting Daily Express/Star). The CST, as Zionist dissident (but venomous right-winger Geoffrey Alderman (see Jewish Chronicle Columnist Geoffrey Alderman expresses his 'pleasure' at the murder of Vittorio Arrigoni, Italian and ISM Peace Activist) shows the CST as a pretty secretive and sinister organisation. It goes to great lengths to hide the names of those in charge of it, having managed to persuade the Charity Commission that uniquely its trustees should not be named on the CC website. The result is an organisation overflowing with cash, with some £3m at least in reserves, paying large salaries to a host of its senior officers. Never has 'anti-racism' been better paid with people like Mark Gardener and Dave Rich receiving salaries of over £150,000 pa, which are far higher than the equivalent salaries in the voluntary/third sector. So under the guise of fighting racism, we have an organisation which combines racism and high salaries for the few. When it appeals for money you can bet on the fact that it doesn't advertise the fact that over £2m of its budget will be spent on salaries alone. 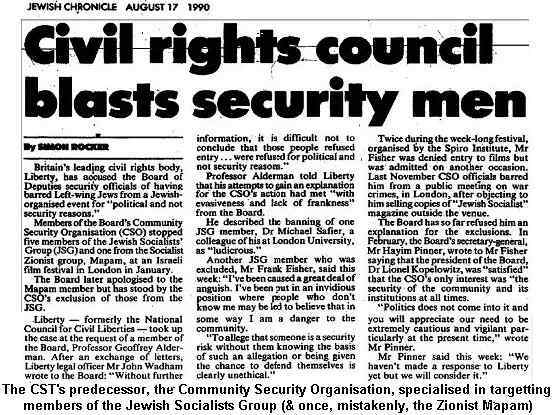 I am copying below therefore two articles by Alderman in the Jewish Chronicle and two articles by Tony Lerman, co-founder and former Director of the Institute of Jewish Policy Research, whose independence of mind led people like Stanley Kalms to call for his sacking. A month ago today, the second most senior police officer in the Metropolitan Police, Deputy Commissioner Tim Godwin, chaired a meeting at New Scotland Yard. A source close to the Community Security Trust told me that the meeting had been held, and that, apart from Deputy Commissioner Godwin the only persons present were representatives of the CST and the Jewish Police Association. According to the Met's press office, the reason for the meeting was to deliberate on how these three bodies might work together "to achieve a secure and confident London Jewish community." How curious, therefore, that while the CST had been invited, the Board of Deputies had not. In my JC column of April 15, while acknowledging that the CST probably did valuable work providing security and security advice, and collecting and publishing security-related data, I asked whether it could justly claim to "represent" the Jewish community. I asked this question in the context of its sizeable budget, the large salaries paid to certain of its employees, and the fact that the names of its trustees were hidden from public view. This seemed to me a perfectly reasonable question to ask. When the JC published in response a letter of condemnation signed by no less than 27 communal grandees, including six vice-presidents of the Jewish Leadership Council, I knew that I had been right to ask the question, and that it had been the right question to ask. But what I did not know when I researched and composed that article was that other members of British Jewry - rather less self-important individuals than the aforementioned 27 protesters – felt exactly as I did. Take, for example, the Manchester-based rabbi who contacted me to say how deeply he resented the intrusion of the CST into the affairs of his community - he meant the CST's insistence that he consult them when planning any communal event. Then there is Nochum Perlberger, the head of the Stamford Hill Shomrim - who provide civilian security patrols and whose efforts to counter crime and anti-social behaviour have had exceptional results. Mr Perlberger confessed to me that one of the conditions of their recognition by the police in Stoke Newington was that they liaise with the CST. And last, but by no means least, take the Jewish Police Association. Ethnically-based police associations are not everyone's cup of tea. But Jewish members of the police service (which included my own maternal grandfather, incidentally) have special needs and, as professional crime-fighters, can make a unique contribution to cementing the relationship between the police and the UK's Jewish citizens, many of whom come from backgrounds laden with suspicion of anyone wearing anything resembling a uniform. So it was natural that Mr Perlberger and his friends should have turned to the JPA for advice when the Shomrim were being formed. It was equally natural that the JPA should want to liaise with Jewish schools, and introduce themselves to Jewish communities. Natural, yes. But with the blessing of the CST? Hardly. As Rabbi Geoffrey Shisler, one of the JPA's chaplains, put it to me, "there have been some tensions between the JPA and the CST in the past. However, a meeting was held recently between the Met and both those organisations, and it is hoped that they have now been smoothed out." Which brings us back to the meeting chaired by Deputy Commissioner Godwin on May 10. My understanding is that this gathering was instigated by the CST, and that its purpose was to make it clear to the JPA that they must take no initiative without the CST's knowledge and approval. Is this what the 27 aforementioned communal bigwigs really meant when they referred to the Community Security Trust's "meaningful representation"? In the JC of March 11, there was an article by Dr Gilbert Kahn, who teaches political science at Kean University, in the United States. Professor Kahn had attended the annual fund-raising dinner of the Community Security Trust, and the purpose of his column was to lament the fact that British Jews felt obliged to pay - via the CST - for the physical protection that the British state should surely provide out of general taxation. What right does it have to represent itself as being a representative body? On its website, the CST boasts that it "represents the Jewish community on a wide range of Police, governmental and policy-making bodies dealing with security and antisemitism." What right does it have to make such a claim? The website further explains that "the Police and government praise CST as a model of how a minority community should protect itself." That may be so but I want to ask whether we - you and I - should not have a quiet word in the ear of government and point out that the CST represents no one but itself and is mandated to espouse the views of none other than its own trustees. Since what I am going to say is likely to raise more than a heckle here and a heckle there, I want to make it clear that I personally believe that the CST probably does valuable work in two related fields: providing security and security advice; and collecting and publishing security-related data. I am aware that it operates in a third and inevitably murky dimension, namely that of a watching brief with regard to extremist organisations, possibly including the infiltration of such bodies. Last year, in a volume of essays I edited by young historians of British Jewry (New Directions in Anglo-Jewish History) I was delighted to include a chapter written by Daniel Tilles on the anti-fascist campaign of the Board of Deputies, between 1936 and 1940. Mr Tilles had been permitted access to hitherto closed files that revealed how the Board had operated a crude network of informers at that time. The Board's defence director, Mike Whine, was candid enough to confess to me that the Board had decided to open these historic files partly to send a very contemporary message: that British Jewry was not averse to such intelligence-gathering, and that groups currently touting an anti-Jewish agenda would do well to understand this fact. Mr Whine, as well as being the current defence director of the Deputies is also an employee of the CST, in charge of government and international affairs. The CST also elects two deputies of its own. I see nothing problematic in these arrangements, but we must fully understand the corollary, namely that the CST itself has no "representative" basis whatsoever. 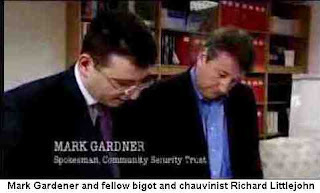 The CST grew out of the Community Security Organisation, which became independent of the Deputies in the 1980s. It enjoys charitable status, so you can discover a certain amount of information about its structure and financing via the website of the Charity Commission. In 2009 (the latest year for which accounts are available), it attracted more than £5 million in donations and boasted reserves of £3 million. It had 64 employees, one of whom received an annual emolument of between £150,000 and £160,000. Its total 2009 wage bill exceeded £2 million. These are not small amounts; they contrast starkly with the services provided to the CST practically for nothing by the scores of volunteers who, under the badge of the CST, provide security for communal events up and down the land. Who makes policy at the CST? The short answer is: its trustees, who appoint themselves. Under a dispensation granted by the Charity Commission, the names of the trustees are hidden from public view. According to the Commission's website there is only one trustee - Support Trustee Limited. But if you go to the Companies House website you can, for a small fee, download the names and contact addresses (and indeed dates of birth) of the directors of STL. Perhaps these individuals could explain to us how, given the constitution and structure of the CST, it can honestly claim to "represent" the Anglo-Jewish community in any meaningful sense. 3. that UCU will campaign for open debate on campus concerning Israel’s past history and current policy, while continuing to combat all forms of racial or religious discrimination. 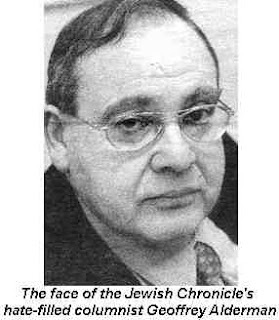 So I was greatly heartened to read Geoffrey Alderman’s recent two columns in the Jewish Chronicle, on 18 April and 10 June, taking the CST to task by questioning whether it ‘represents’ the Jewish community and arguing for much greater transparency about its policy-making and operations. I can hardly say that Alderman and I see eye-to-eye on many things, but on this issue – one which I first began to raise 10 years ago – I think he has done us all an important service by airing his concerns in public. Unsurprisingly, the CST did not like Alderman’s intervention and he was slapped down in a letter to the JC from 27 communal grandees. Reporting this in his second piece on 10 June, Alderman provided evidence from decidedly un-grandee-like members of the community supporting his concerns. These criticisms of the way the CST operates echo numerous comments community activists and professionals have made to me privately, insisting that they did not want their names to be made public if I ever wrote about the issue. Most had dual reasons for wanting to remain anonymous: first, because they feared that the CST could try to pressure their employers, or the organizations they worked for on a voluntary basis, to oust them; second, because they were aware that such a climate of fear of antisemitism exists that they did not want to be seen to be undermining efforts to combat antisemitism, even though they did not believe that the climate was justified. ‘Either you’re for us or you’re totally against us’ expresses an oversimplified, often bigoted world-view. It’s easy to brand others as antisemites, hard to engage at the borders between ourselves and those who don’t see the world as we do. . . . My point is that we shouldn’t make ‘the world hates us’ our motto. Whether or not he was referring directly to CST as being largely responsible for encouraging this mindset, I don’t know. But you only have to read the response of the Chairman of the CST, Gerald Ronson, to Alderman’s questions and criticisms, which Ronson gave in a JC op-ed on 29 April, to realise that the size, reach and influence of CST makes it perfectly capable of being a prime mover behind the creation of a ‘the world hates us’ atmosphere in the community. And now we have a further deeply thoughtful and searching critique of the whole notion of ‘security’ and the role of the CST in a superb article by Rabbi Howard Cooper just published in the latest issue of the Jewish Quarterly. In ‘What is our security?’ Rabbi Cooper tells two stories. The first, drawn from a story he was told as a child, exemplifies how a relentless quest for security can produce precisely the opposite because it can be hard to bear the reality that ‘security’ – what it is, what we need in order to achieve it, where it comes from, and what we feel threatens us – is an internal experience. This story – and it is not a parable – filled me with an immense sadness. I knew that this enlightened young woman had a sound understanding of how we unconsciously project onto others disowned feelings from within ourselves, and then feel ourselves threatened by those very feelings. If even she had succumbed to collective Jewish unease about Muslims, what hope was there for our collective well-being in the UK, when the community is led by by those with a less-psychologically-informed and more outwardly belligerent approach to questions about security? We are driving ourselves mad because of a spurious fantasy: that there is something called ‘security’ that we can achieve and possess. But feelings of ‘insecurity’ are psychological, spiritual, existential – such feelings can’t be eliminated by more of this chimera we name ‘security’. Such is our post-Shoah concern with security that the original meaning of security in Hebrew, ‘trust in what we cannot see’, has become precisely the opposite, ‘trust in the power of our own hands’. Has the Jewish tradition to articulate a moral vision now finally come down to ‘Praise the Lord and pass the ammunition’, what seems to be the fundamental ethos of the religious settlers in the West Bank, he asks. Perhaps to experience ‘security’ we need a renewed faith in aspects of ourselves that we Jews used to attribute to the Holy One of Israel: a capacity for compassion and reverence towards other human beings, a capacity to discern forms of idolatry that offer false security, a capacity to transmute anger into a passion for justice, and an enduring capacity for truth-telling that holds the impossible tension between love of the Jewish people and a responsibility to the ‘other’, the stranger, the outsider, who may never love us but whose well-being is still our concern. Not only moving, but sound advice. Especially important, and sorely needed today and at all times, is ‘truth-telling’, with telling truth to power a fundamental priority. Alderman, Wittenberg and Cooper have taken very significant steps in this direction. The grandees of the community, the self-appointed guardians of our ‘security’ and the mainstream religious establishment should immediately take note. They already have a lot to answer for. I can never get my head around the philosophy of people like you - Jews who hate Israel. Useful idiot is probably a good description of your role in any debate. Press TV loves you. Yet, Hitler wouldn't have bothered with nuance - he would have just had you killed an so would the Philistini if they met you. Time to wake up! Well I thought I may as well let through the odd Zionist oddball! Anon says that he can't get his head the fact that some Jews 'hate' Israel. Actually I don't hate Israel so much as detest Zionism and all it stands for. A subtle difference that Anon probably won't comprehend. Oh it's probably something to do with all those anti-Semites who shouted 'get back to Palestine' or the fact that Nazis like Eichmann said that if they had been Jewish they would have been the most fanatic Zionists of all or that Alfred Rosenberg used to cite Zionists to justify Nazi racial fantasies or even the fact that Israel is founded on racism as a Jewish state. Yes the possibilities are endless but the fool probably doesn't even understand. As regards Press TV, it also ‘loves’ Richard Millett, that American nutter Charlie Wolf, Geoffrey Alderman and scores of other blatantly pro-Zionist Jews. But Tony Greenstein I’ve never had the pleasure to see on Press…’Nuff said. Mark ‘Rivers of Babylon’ Gardener earns 150 Big Ones from his ‘charity’ work as a pro-Zionist?!?!? Blimey, I wonder how most in the Britjewish community feel about that! That's right. I think I've appeared once, in the audience with Richard Millett and others, as part of a Press TV discussion. And who was on the panel? Why J Hoffman, the EDL's friend and Carole Gould!